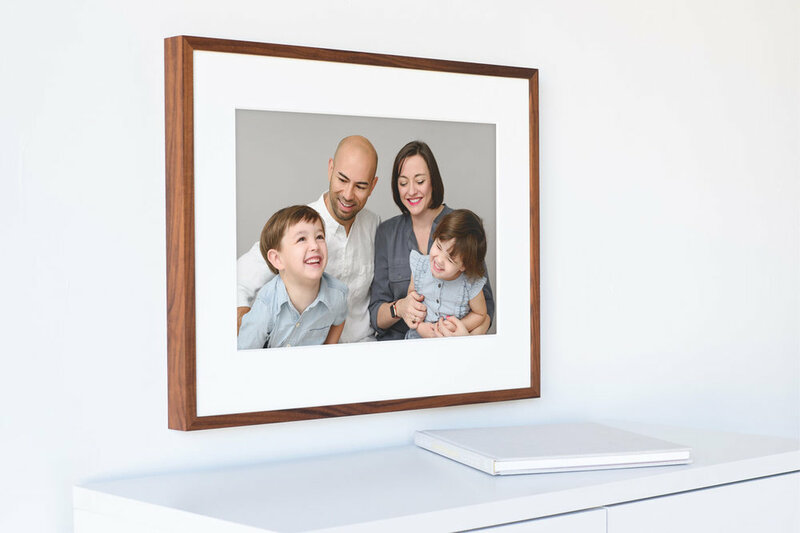 Here is the biggest mistake people make when purchasing frames for their photographs: they determine the size of the frame based on where they want that frame to live in their home. Sounds pretty logical, right? It is.. until you realize that you probably won’t be living in that house forever. People move (every 7-10 years on average), and they take their stuff with them. Which means that perfectly sized frame will soon have to fill a totally different spot. So how SHOULD you decide on print/frame sizing? You should think about two things 1. what’s actually in the photograph, and 2. how big of an impact are you trying to make? This is the smallest framed print I sell. It’s perfect for kid’s rooms and bathrooms because those tend to be the smaller spaces in the home. It’s also best for a photograph that features one person only and have a fairly close up shot of their face. This is NOT the right size for a family portrait on the wall. An 8x10” print is still considered table-top size and it’s really a starting point when considering a framed portrait. Once again, the only type of photograph I would recommend for this size is a closeup of a single person or child. For everything else, you’ll want to size up. 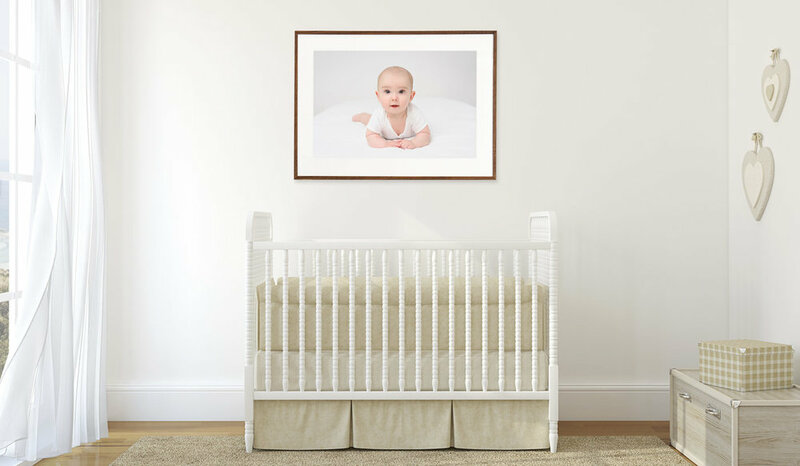 This is a very versatile size and you can probably find a spot for an 11x14” framed photograph in any room.. It’s big enough to showcase siblings or a full-body portrait of a baby, but I would size up for a family, although a family of 3 or 4 might work (as long as the image is close up). The thing to consider is how close someone will stand when they will be looking at this photograph. If the viewer will be closer up, you can display more detail.. but if the print will be viewed across the room, you will want to make sure the photograph is simple and uncomplicated. This is the smallest size I would suggest for a family portrait. It’s not as big as you’re probably imagining, especially once you hang it on a blank wall. The trick to making things look cohesive in a home is matching the size of the object with the space that it will fill. If you have a smaller space, putting a large frame into it will make it look right at home.. while a smaller frame will make it look like something is missing. Often with this size, it helps mapping out what the result with look like and my clients have the ability of emailing me a picture of the spot they’re considering so I can virtually place the frame in the space (I use a specialized app to do this). Often it really helps to see things visually, which is why I have the digital tools and physical Studio samples to help my clients. This is the size with impact. It looks great on the wall and can comfortably display a family image with plenty of detail. My favorite use for a 20x30” is to feature a portrait of a child to create a stop-in-your-tracks impression when people see it for the first time. This is also the size I chose to go above the fireplace in my own home. Any smaller, and the photograph of my two boys would have looked out of place, even with the lower ceilings New England capes are known for (that being said, our home’s original fireplace is quite large). If the sound of 20x30” scares you a bit, it’s probably because we all feel more comfortable with committing to a smaller size. But if you think about it, to fill up the same space, you can do 3-4 smaller frames, or 1 large one. And which do you think will make the bigger statement? For sizes like 8x10" and 11x14", the image will need to be cropped on the long edge in order to fit into the frame (meaning, you will be missing part of the photo). This has to do with the aspect ratios and photographic history. The 3:2 ratio follows the 35mm film standard and includes sizes like 4x6", 8x12", 16x24", and 20x30". These sizes will show the entire image in the print. But if you've ever printed photographs or purchased frames, you will recognize sizes like 5x7", 8x10", 11x14", and 16x20". Those are derived from the very early large format cameras that had a totally different aspect ratio.. and they are still the most prevalent sizes for prints (even though none of our cameras follow that standard now). Since all of my photographs are printed in the 5x7" size (once again, following the popular sizing of today), I capture my images with the crop in mind. My clients get the benefit of me adjusting the images to perfectly fit into whatever space (or frame) the portrait is getting printed for. But if you're DIY-ing framing or printing your own photographs, you will need to keep an eye out on this slightly baffling thing we all have to deal with. I often hear the following: "We have all black frames in the house, so I guess we'll go with the black". Not necessarily! Take a look at the photograph and pair the frame to go with it, instead of what's already in other rooms in the home. Not only that.. but you can mix different frame finishes, as long as they're all within the same style family (all traditional, modern, rustic, etc). I have a lot of black-framed posters in my home, but I went with a large walnut frame in the living room. I absolutely loved the wood grain and it brought the much-needed color to the mostly white and gray portrait I was framing. Consider your decor, your style, and the image to make the best decision, because each room has it's own personality! I provide a service that ranges from my clients being able to DIY everything, to having me handle every detail when it comes to framing. You have to know yourself to understand which option is right for you. When you're doing everything yourself (including printing, because you do receive the high resolution digital with every print you purchase), you will save money.. but the materials won't be to the same standard and you will be spending a lot of time doing the actual work. You can also opt to have me handle the printing and either do the framing yourself or work with a framer of your choice - this is a great option if you like more traditional frame styles or want ornate frames that I don't carry. The easiest and most expensive option is to order the frame through me. This is because of several reasons.. you won't have to do anything (as in, I do all the work.. including the final step of actually hanging the frame on your wall), you'll get the benefit of all the research and samples I've gone through to find the best frame vendor and materials, and you get the peace of mind that everything will be done right. In the end, the choice is yours! The main point is.. putting a framed portrait on your wall is one of the best ways to create a home interior that is meaningful and beautiful at the same time. Your children will love seeing themselves on display (they are all little narcissists at that age) and you will love seeing them, too. Decorating is one of the more challenging aspects of owning a home, and I am so thankful to be able to provide beautiful art that brings such joy and carries so much significance to the families who own it.